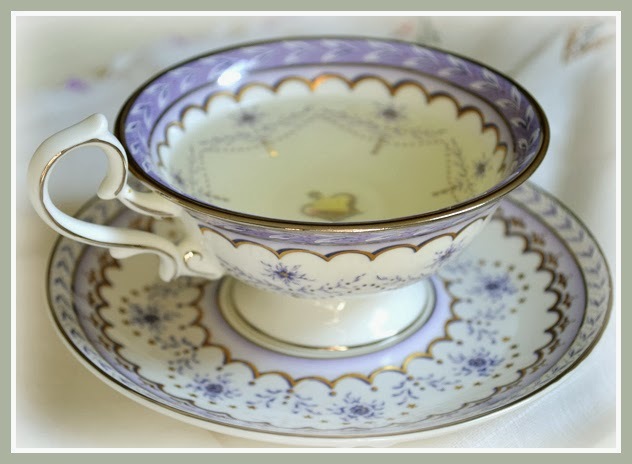 Artful Affirmations: Tea Cup Tuesday-Gloomy Day...Cheery Tea! Hi Terri...that's a lovely cup! I remember seeing it at the shop. Ginger tea is my husband's favorite herbal. He likes wither the Bigelow or Celestial Seasonings Lemon Ginger or Jammin' Ginger. It's a bit too warm for me....It's been coolish here, but not cold. Keep warm and thanks for hosting! 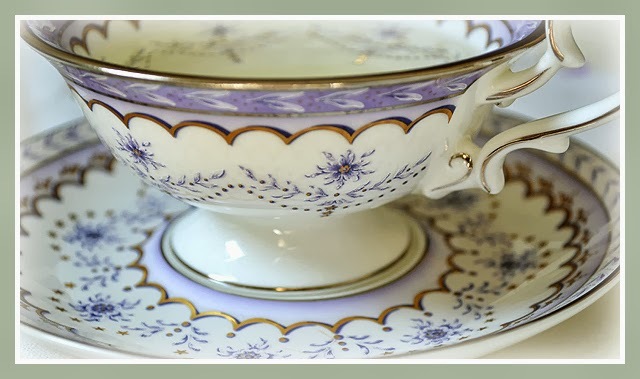 Terri, that is one of the prettiest teacups I've seen. The history of it and the memories of your visit to England must make it all the more special. 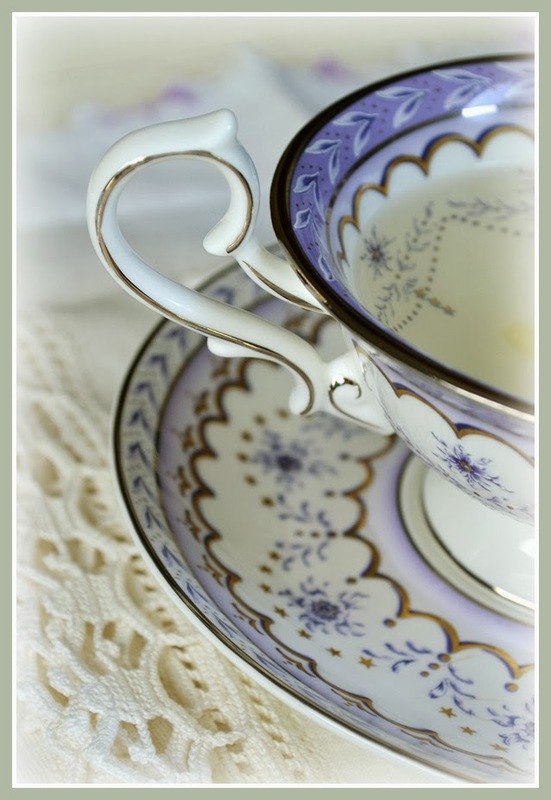 I love the way you show and photograph your teacups, even more the history you share. Thank-you. What a wonderful tea cup! I love blue dishes and this one is very beautiful and sentimental! I love love your Royal Collection tea cup. so lovely and so delicate with elegant handle, truly a nice set fit for a queen. I noticed that shop also when I was in London but at that time they were selling a set with different pattern and shape. 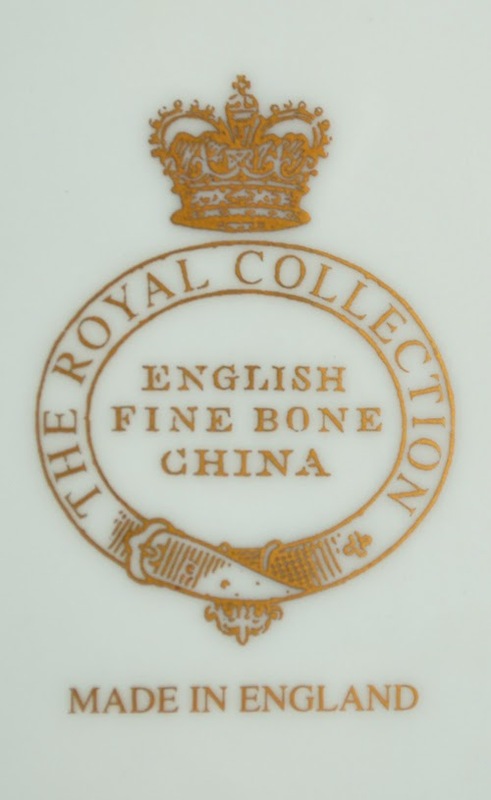 Having bought one set in a flea market already and due to its delicate material-- bone china, I did not continue my tea cup buying activity, ;-)but then I forgot, the Royal Collection usually comes with a secure box. Terri, What a lovely teascape! The Royal teacup is stunning ... so romantic. Homer Laughlin anything -- great! The carrot cake cupcake is making my mouth water. Add in the beautiful linens ... wowzer. I would have grabbed the deer, too. Thanks for hosting and happy tea day! What a lovely and delicate cup! The cake sounds yummy. We are still in the deep freeze here, but Spring is coming. Now the push is on for me to finish all those cold weather projects I was determined to complete this winter. What a beautiful and welcoming vignette! Can you tell us how to make fresh ginger tea? It sounds fabulous. Carrot and cream cheese frosting cupcakes...Yes! Yummy. And that cup and saucer set is beautiful! What a pretty teacup and how lovely that it came from a shop across the street from the Palace. I love the runner with the deer; it's darling! Thank you for sharing and have a beautiful day. What a special tea cup you have there! I will have to check the link as that is so pretty. I would love to get to England one day and shop there too. They would be perfect for tea with my Jane Austen group! thats an extra gloomy tea cup for this special day. I really love all the fine details. You have chosen the perfect plate to that cup. And the cake looks delicious. Thank you for sharing and for hosting this sweet event. 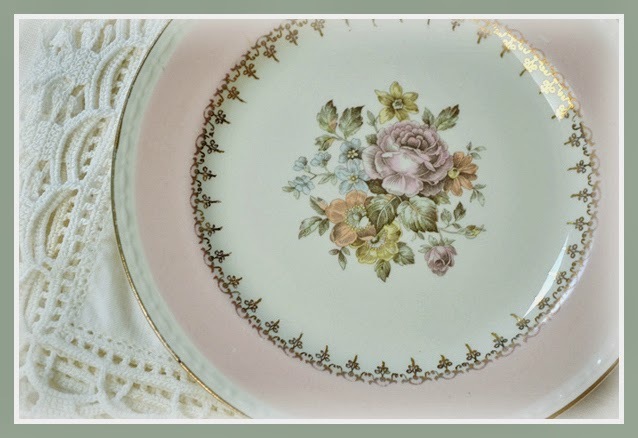 The teacup is stunning along with the pink rimmed plate! The carrot cake looks awesome too. Thank you for the lovely tea party dear terri. Although my table is for a luncheon, at the end we do have cake for dessert and tea in lovely cups, I should have set a place for them too. Terri, I love that tea cup. Were you there for her 60th? I admire her -- she has such an indomitable spirit. The details on the cup are gorgeous. I may just pop over and have a peek :) Stay warm, hopefully it won't be long now!! 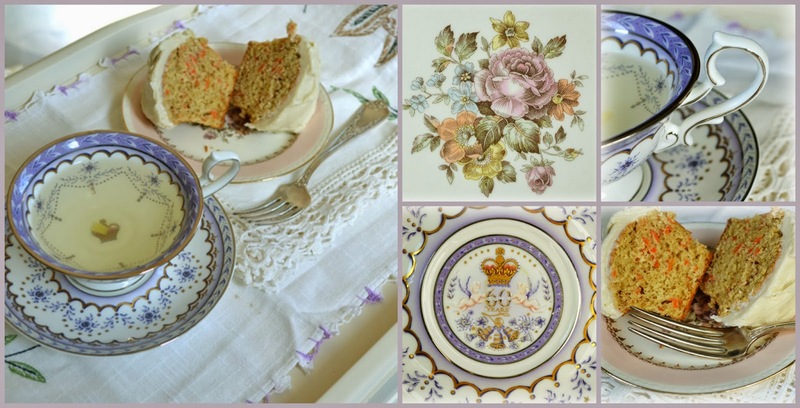 Oh what pretty things to make your tea very special indeed! Wow- to go from 70 to 28 along with snow and ice-ugh. I would have loved a warm day but I am so grateful the expected dumping of snow we were supposed to get passed us by despite it feels like about 3 degrees outside. Absolutely lovely, lovely, lovely dear Terri! Thank you for sharing all these scrumptious photos! Wish I could've joined you. That teacup is so delicate. I like the shades of blue in it. Terri - you're teacup collection is a marvel! This one is especially lovely as to the story behind it - purchasing it in London and NOT a thrift find! Love the delicate artwork - on the cup and the plate. Just lovely - as always. Such a beautiful cup you have used today! It is very delicate. Thanks for hosting! Hello Terri. That tea cup is perfection. How elegant and beautiful. And what a great piece to own. 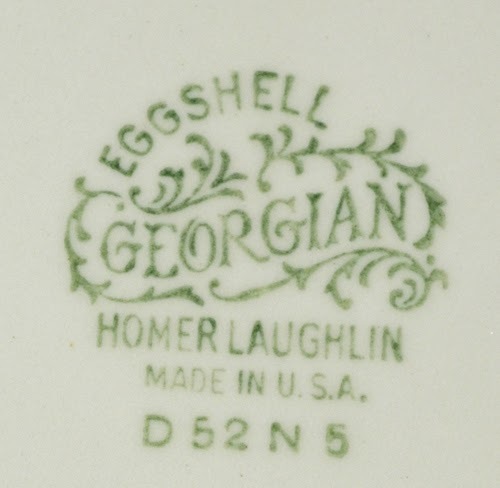 I own a few Homer Laughlin Georgian Eggshell pieces. They are truly stunning. Thanks for hosting and have a wonderful week. 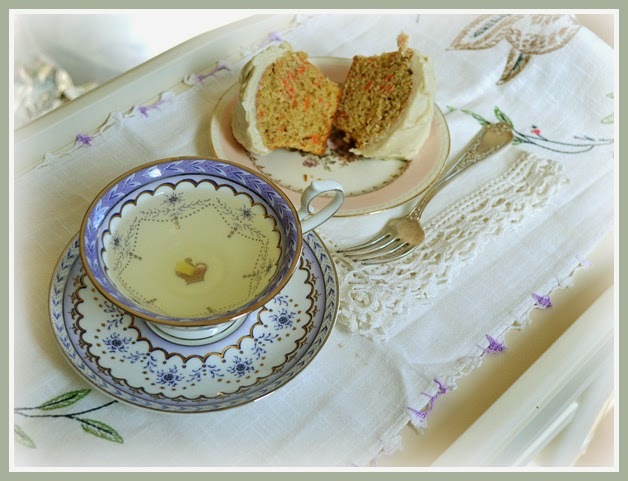 Stunning teacup, love it and your vintage plate is pretty...cupcakes with cream cheese frosting, can't go wrong there, yum! That is a great post. I loved everything. Your teacup is so pretty. I love the design. I have never seen that one and I love that company. They make such classy things. Loved your embroidery and your Homer plate too. Tea from your cup makes you Queen for a Day! Here it is like springtime! I hope it wi stay all the time tille summer like this! 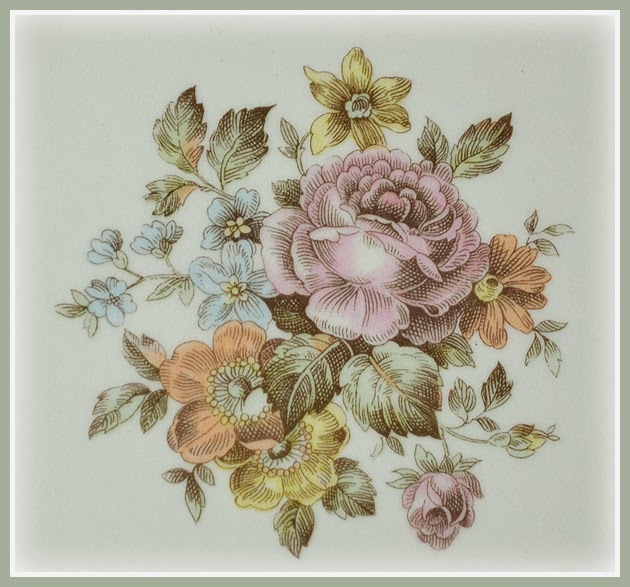 A beautiful cup and saucer Terri and I love your vintage embroidered table runner. My teenage daughter is particularly fond of deer so I shall send her a link. Thank you for your lovely comments on my blog. That is such a delicate teacup and saucer of celebration. I love the sweet pale shade of blue! That carrot cake looks so yummy! I'll sip on some ginger tea here as we practice patience sitting and waiting. Hi Terri!! Gorgeous cup..dazzling blues and so elegant...very special! I fell in love with the pink plate..very charming..romantic and simply beautiful!! Thanks for sharing another stunning post....and ever so yummy too! Always a joy to visit your realm! Wow, I love the teacup, so beautiful! 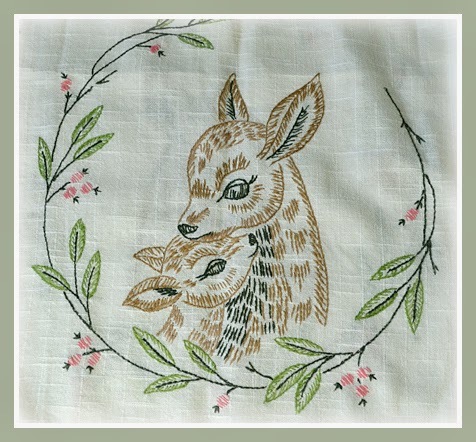 I am in love with the deer embroidered runner, deer/fawns is my favourite animal...so cute! Hi Terri, oh my oh my oh my. That cup and saucer is just too pretty for words. 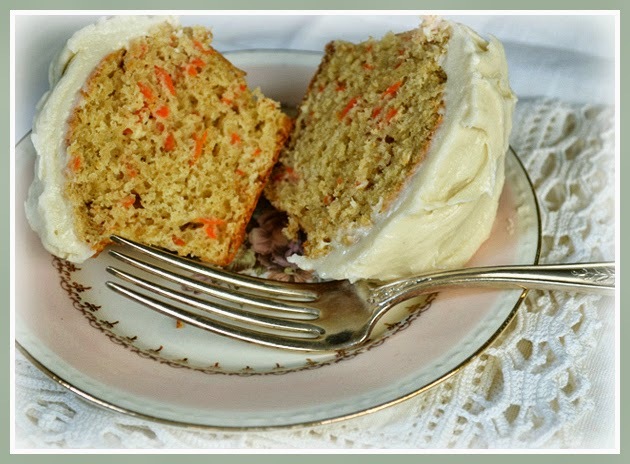 I haven't had carrot cake for years...looks so yummy. Your weather is sure back and forth. Very delicate looking teacup Terri. Perfect for dreary weather. Hope you'll get some sunshine soon. Thank you for hosting, I'm glad I just made it. And oh your carrot cupcake looks delish. 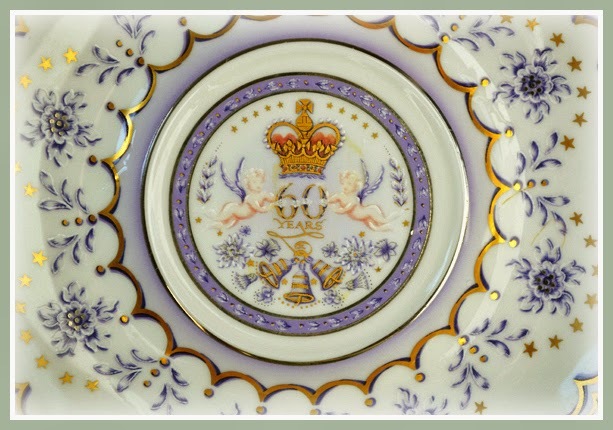 Your commemorative teacup is beautiful and so is your tea tray setting. Ginger tea sounds good to me and the cupcake looks yummy. Oh Terri, it's always such a pleasure to visit your blog. You have the prettiest collection of teacups and such a treat to see. I love this pretty little set, so soft and delicate. Your cake looks, so good.